Nerves, anxiety, and fears; these are three things that can cause mental blocks for gymnasts. Gymnastics is a very difficult sport that involves not only body movement, but mind movement as well. Gymnastics is a sport that calls for thinking before performing. Gymnasts literally have to think about two steps ahead to mentally prepare themselves. If your gymnast is nervous, has anxiety, or develops fears when it comes to him/her performing and competing, do not worry. It is very common for your gymnast to feel this way. If you are looking for advice or tips when it comes to your gymnast trying to overcome nerves, fears, and anxiety; please continue to read! As we all know, gymnasts have butterflies in their stomachs before a big meet. Just like every sport, your gymnast puts in a lot of time and effort to make his/her performance as perfect as he/she can. I am sure your gymnast can perform his/her routines at his/her home gym flawlessly, but competing against other gymnasts in front of a big crowd and having the thought of the judges watching your gymnast can be nerve-wracking for him/her. To be honest, even gymnasts that have been competing for YEARS still have butterflies. Each meet your gymnast competes in is different. Your gymnast is competing against different teams, in a different gym, with different judges. Of course, your gymnast will get used to how meets are run and what they are like after a few years of competing, but you cannot expect your gymnast to completely get over his/her nerves. Make sure you reassure your gymnast that it is OKAY to be nervous. Communication is one of the keys to a great relationship. Let your gymnast practice his/her routine at home in front of you. Before each meet, invite family members, friends, or even neighbors over to help your gymnast get used to people watching him/her perform. Practice breathing patterns with your gymnast. This will help your gymnast take deep breaths before, during and after his/her performance. Practicing breathing patterns is beneficial because it will help your gymnast calm down. The most common breathing pattern is taking a deep breath (inhaling) through the nose, and letting it out (exhaling) slowly through the mouth. Who here wishes anxiety was not a thing? I know I sure do! Anxiety is a mental issue that can cause your gymnast to think negative about himself/herself, his/her performance, or to think what the worst thing could happen in a scenario. Anxiety is a real thing that affects many people on this earth. If your gymnast has anxiety it may cause him/her to think he/she is not good enough, may prevent him/her from doing a specific skill, or even cause your gymnast to lose confidence. It is important that your gymnast is confident because that is what will help him/her to perform to the best of his/her ability. Having confidence is good for the mind, the body, and the soul. If your gymnast’s anxiety is serious, start looking into therapy. There are counselors that work specifically with athletes when it comes to anxiety. Please do not let your gymnast’s anxiety go, please take action. If your gymnast’s anxiety builds up, it can cause more serious problems. If you do not want to pay for therapy or if your gymnast does not have time, meditating is another great way to help reduce anxiety. This is something you and your gymnast can do together as well. You and your gymnast can sit on yoga mats (or rugs, or something similar if you wanted to) and practice breathing patterns together. It helps best when you are able to find a quiet place and are able to close your eyes. If you do this a couple times a week, it can help calm your gymnast down. Yoga is another great technique because it not only helps you relax your mind and body, but it also practices strength and flexibility. Yoga can help with giving your gymnast confidence because he/she will be able to perform flexibility skills in a calming matter after he/she is used to yoga. 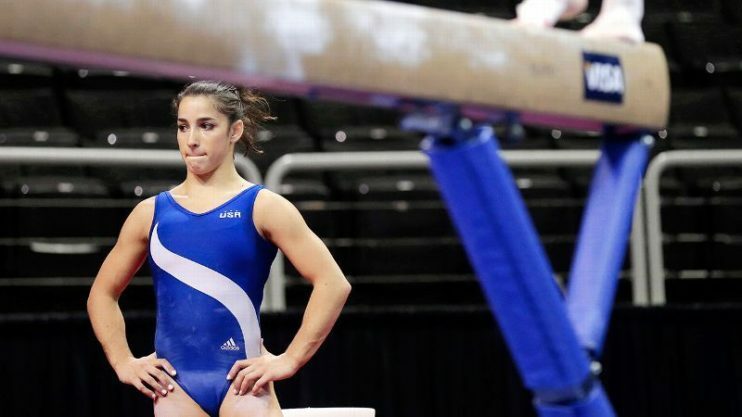 Fears are normal for gymnasts if they are learning a new skill, getting back up after falling or making a mistake, or coming back from an injury. Gabby Douglas is right. Sometimes you have to face your fears in order to move forward. Your gymnast needs to build his/her confidence in order for him/her to overcome his/her fears. Always remember that the more your gymnast practices, the better he/she will get. One day your gymnast is going to look back on his/her fears and remember that he/she had to conquer them to get to where he/she is today. Set up a meeting with your gymnast’s coaches and your gymnast. It is important that your gymnast’s coaches are aware that your gymnast has fears. Like I mentioned under overcoming nerves, communication is really important in a relationship. Your gymnast’s coaches know what is best for your gymnast because they know what he/she can do. Your gymnast’s coaches would never have your gymnast try anything or do anything your gymnast is not capable of doing. Work on confidence-boosting activities. This will turn your gymnast’s thoughts from thinking “I can’t” to “I can“. It is very unlikely that your gymnast will get a skill down pat the first time he/she tries it. Just like all things, it takes time and practice. Not getting the skill the first time can discourage your gymnast, but practicing confidence-boosting activities will motivate your gymnast to keep trying and to stay positive. Take things step-by-step. Have your gymnast understand that it is OKAY to not rush into things right away. Your gymnast’s coaches will work at a slower pace to make sure your gymnast is comfortable doing what he/she has to do. Your gymnast’s coaches are looking out for your gymnast’s best interests and are great mentors as well. Please feel free to comment below and give any feedback, experiences, tips or advice when it comes to your gymnast overcoming anxiety, nerves, and fears!